Mahindra Thar is one of the first choices of off-road enthusiasts for various reasons. The Thar is mighty capable in the right hands and it also is a value-for-money vehicle that can be fixed without putting a big amount of money. But how capable is the Thar? 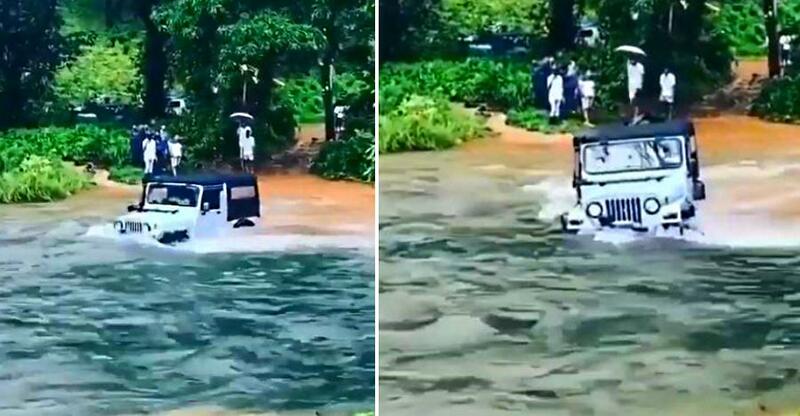 Here is a video showing the Mahindra Thar crossing a river! The exact location of the river is not known but it looks like a river on the plains during the monsoon season. The flow of the river is quite high and the water level is reaching the brim! A Mahindra Thar can be seen already in the river when the video starts. Due to the massive flow of the river, the Thar even starts to float in the river but soon the tyres found the grip on the river bed and the Thar can be seen gaining back the control. Losing the traction in such situations is quite dangerous and is very scary too. It feels like floating in the air and there’s no way, you can steer the vehicle until the tyres settle down on the river bed. The Thar can be seen braving the strong current of the river to reach the other bank. The manoeuvre through the river is not the easiest thing to do. It requires a very capable vehicle as well as a skilled driver who would not panic in such situations. Also, it should be mentioned that such stunts should not be done alone. Always have vehicles that can pull you out of if the vehicle gets stuck in the middle of the river. In fact, one should never venture out to the unknown terrains without a recovery vehicle. The Mahindra Thar crossing the river in the video is not heavily modified either. From the video, we can see that it gets a snorkel that helps the SUV go into deep water without putting water in the engine air intake. The Mahindra Thar does not come with a factory-installed snorkel like the Force Gurkha but it can be installed as an optional accessory. Apart from the snorkel, the tyres of the Thar are aftermarket too. The aftermarket tyres ensure a greater grip and allow the vehicle to reach difficult and challenging areas. Rest of the vehicle look like stock from the video. Going through such deep water crossings require a lot of planning too. While crossing the water, the driver needs to put constant accelerator input so that there is enough pressure in the exhaust and water does not enter through it. Also, one cannot see the terrain under the water, which makes it even more difficult. So the driver needs to be ready for the unexpected like rocks or dips on the riverbed while crossing it.